Treat your near and dear ones in an exclusive way with this Charming Laughing Buddha with Best Wishes and make them feel very special. 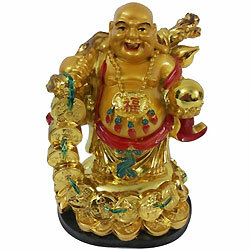 The Laughing Buddha statue is a symbol of happiness and contentment. The bag of gold and the Ru Yi held is for spreading Happiness, Wealth N Prosperity in the life of your loved one.